This narrative film based on a graphic novel by Joseph Joffo and Vincent Bailly purportedly relating true experiences takes place in Paris and Nice, exhibiting a phase of the Holocaust as seen through the eyes of ten-year-old Joseph (Dorian Le Clech) and his big brother Maurice Joffo (Batyste Fleurial). 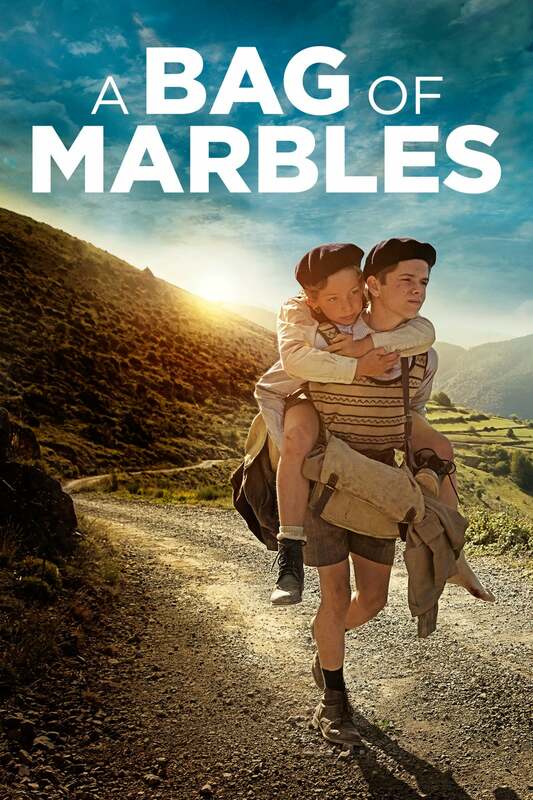 “A Bag of Marbles” includes some shots of unprovoked brutality, although if you’re seen enough Holocaust films and read enough books on the tragic era, you’d be naïve to think that this represents Germans and some French acting on their full-pledged antisemitism. The director, Christian Duguay, has a resume packed with TV episodes including one called “Human Trafficking,” about the brutality of kidnappers who sell young women into prostitution. An authentic performance by Patrick Bruel in the role of the boys’ father is the highlight, a man who runs a barber shop in Paris that caters only to Jews (who in 1942 would not be allowed to patronize a shop run by Christians). For me a big surprise was that two German soldiers among the occupation troops in France’s capital visited the barber as customers, and that Roman, the boy’s father, freely stated to the two customers that “everyone in the shop is Jewish.” I had figured that by 1942 the windows would be broken, a Star of David would be painted on the walls, and the Jews would have to go immediately into hiding. Since the film involves the travels of the two brothers without their parents to a freer area in the south, largely on foot but sometimes by hitched rides, you could this a road-and-buddy pic, involving various people, mostly friendly and talkative. Among the events encountered by young and naïve Joseph, who could barely believe that the lives of Jews were in danger, and his more mature, older brother Maurice, is one in which the lads, traveling alone on a train heading south toward Nice which was governed by the French Vichy regime under Petain, are terrified when about to be confronted by the authorities asking for papers (they had none). They came under the immediate protection of a priest, one of two gents of the cloth who would protect the identity of the two. Other events include their presence in a training program of youths expected to fight for Germany, wherein the boys feign Catholicism, and another in which Joseph, following the counsel of his father who literally beat into him that he must always deny his Jewishness, worked for an anti-Semitic bookseller for six months without guessing the identity of his employee. This middle-aged shop owner, who would be dealt with by the Resistance after liberation, blamed the Jews for the war, a classic Big Lie of the Nazi regime, and who furthermore states that the real enemy of France is England, not Germany. With a solid supporting role by Elsa Zilberstein as Anna Joffo, the boys’ mother, “Bag of Marbles” is yet another film on the horrors of the Nazi regime with its own particular niche. It should be required viewing by those who tend to believe whatever governments are telling them, with a manifesto that should read “Question authority: Trust No One.” This especially in view of the rightward movement of several Western countries whose naïve citizens are going along with the hatred spewed by candidates for government. Beware of anyone with statements about neo-Nazis and white supremacists in our own country that there are fine people among them.